Beacon Falls, CT – June 19, 2017 – Lavatec Laundry Technology, Inc. successfully introduced a new Ride-On Shuttle, the LT50 110-pound continuous tunnel washer, and the osLaundry software system at the 2017 Clean Show, held June 5-8 at the Las Vegas Convention Center. Just as impressive was Lavatec selling a majority of their booth equipment to several customers during the four-day event. Lavatec's new Ride-On Shuttle was a hit with the crowd at the Clean Show. "We are thrilled with the results of this year’s Clean Show. There was good traffic throughout the show, and there were times where our booth was packed with people," remarked Keith Ware, Lavatec Vice President of Sales. "We enjoyed many good conversations with customers and others about our new and existing equipment, including the TT-series Ecodry dryers. As expected, the Ride-On Shuttle was a hit with everyone. It was located along the main aisle and it stopped people in their tracks. That led to them coming into the booth to learn more about it." Ware indicated Cintas has purchased the first Ride-On Shuttle. Cintas also bought the Lavatex LX445, a 450-pound open pocket two-way tilting washer extractor and a Lavadry TT-756 G, a 450-pound pass-thru single tilting gas fired dryer. The two units were displayed and connected to the Ride-On Shuttle at the show. Cintas plans to have the machines in operation at its Yonkers, NY facility some time in Q3. "The Ride-On Shuttle gives an operator the ability to control washers, dryers and the rail system from the safety of a technology driven cockpit," said Ware. "Like other Lavatec equipment, it is simple to run, easy to maintain and it will run for a long time. Most everything an operator needs to do can be done from the protected area. It has built-in sensors for the operator’s safety in case he needs to leave the shuttle, and it also gives them the flexibility to handle production in a more efficient manner. It’s exactly what larger operations are looking for." 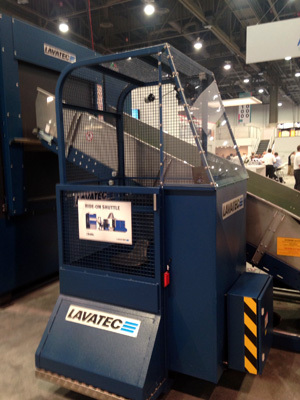 Manufacturing the industry’s leading continuous tunnel washers, Lavatec displayed the new LT50-10BT. North Grand River Co-Operative, a laundry in Lansing, MI managed by Sodexo, purchased the LT50 as well as a 110-pound, 40-bar single stage extraction press and four new TT-series Ecodry dryers. They will be adding the new osLaundry system to the LT50, which is in the early stages of installation in the coming weeks. "Many of the people we talked to were impressed with osLaundry. Having a software solution that can be integrated into all of our new equipment was a major victory for us and our customers," noted Ware. "Our staff received more great feedback about it. We found they liked learning about the remote diagnostic support and real-time information that will allow them to make more informed decisions on a quicker basis. Many operations realize they need to be more efficient, and osLaundry gives them the tools to do so." Ware said his staff answered many inquiries about the row of TT-series Ecodry dryers that took up residence along the back end of the booth. "From when we first previewed them a couple of years ago, the Ecodry dryers have undergone a few changes that make them unique in the marketplace," confirmed Ware. "Many of the people liked the large glass windows that allow you to clearly see linens being dried. The smart technology built into the machine puts it on a different level of efficiency and throughput. The line burner covers the entire drum and is the ace in the hole that drives efficiency. Not only do you get great quality, but you also get the benefit of having the shortest possible drying times. That’s what many people want today." Huebsch Services of Eau Claire, WI purchased the FL633, a 175-pound capacity gas fired dryer. It was demonstrated next to the LAVAFOLD MAXI triple towel folder as part of Lavatec’s agreement with Continental Girbau to market specific equipment.